Cracked teeth have many types of symptoms, including pain while chewing, sensitivity to hot and cold, or even the release of biting pressure. It is also common for pain to be inconsistent and not constant, making it harder to diagnose the cause of discomfort. 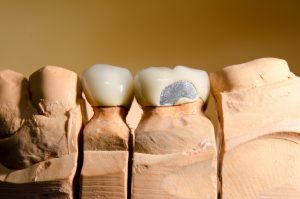 Cracked Tooth – This type of crack extends from the chewing surface of the tooth and vertically migrates towards the root. In some cases, the crack may extend below the gum line. It is possible for the crack to extend further into the root. Damage to the pulp is a commonplace. In this case, root canal treatment is usually necessary. A cracked tooth that is not treated will worsen, resulting in the loss of the tooth. Therefore, early detection is essential.